Alright kids, it’s almost time for Tu B’Shevat, the birthday of the trees. First, we kick off the holiday by reading the story of Tu B’Shevat with one of our book reviewer Tamara Levine’s new favorite books, Happy Birthday, Tree! written by Madelyn Rosenbery. What would you give a tree for its birthday? Ribbons, water, a present? Does it have all that it needs already? Joni in the picture book Happy Birthday, Tree!, written by Madelyn Rosenbery and illustrated by Jana Christy, doesn’t think so. She believes her favorite tree needs something for its birthday so that it can celebrate. Tu B’Shevat is one of the Jewish New Years. It’s the birthday of the trees, of course! It’s celebrated on the 15th of Shevat. This wonderful craft project by blogger Miri Flower is a great way to bring a little light during a dark time of the year, while connecting to the spirit of Tu B’Shevat. A craft to brighten up your day, close the curtains, turn off the lights & read a book by the light of a couple of these beautiful lanterns! 2) Glue the leaves onto the top half, fold over the bottom & glue it together. 3) Cut a circle out of the cardboard, fold up the edges & glue your tissue paper around the circle. This is the bottom of your lantern. 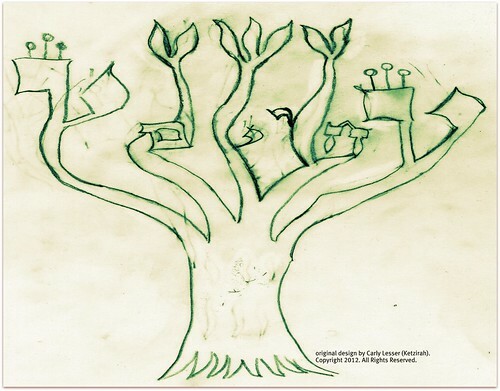 Of course, there are lost of great learning opportunities on Tu B’Shevat. Check out our Tu B’Shevat Portal for resources on the holiday, podcasts and grown up how-to guides. Tu B’shevat is very much a minor holiday to us today, perhaps it’s because most of us no longer work the land to provide for our families and communities. Perhaps it’s because few people care for the Earth as deeply as we once did. Whatever the reason is this is no longer a holiday celebrated by most families with a full Seder. It’s now seen almost as an Earth day or Arbor day. A day that even most people in America don’t tend to celebrate. Tu ‘B’shevat is important to me though, it is the new year for the trees. What exactly does a new year for a tree mean? One thought holds trees as one of the closest to immortal things living on this planet today. While no tree is immortal some are very old. The oldest non-clonal tree in the world today is known as The Sisters or the Sisters Olive Trees of Noah, The sisters are believed to be over 6,000 years old and is thought to be where the dove found the olive branch to bring Noah at the end of the great flood. What is another year for them? What does that mean for us? The trees new year means for them an awakening. Almost all trees especially fruit baring ones go through a dormant phase during the year and Tu B’shevat is the time that inside of them they grow another ring. This ring might be thin or thick depending on how the growing season treated them. You can learn a lot about a trees life from their rings. So what does that mean for us? It’s hardly time to plant trees the only thing right now you can do is prune the dormant and dead branches. Well for us I believe that Tu B’shevat is a great time for our own awakening. It’s time to awaken to ourselves and to our soul. The great thing is that we don’t have a yearly dormant phase but perhaps our community involvement or passions or even our spirituality does. Perhaps you were volunteering your time more frequently around Rosh Hashanah. Or maybe you get in the mood to let your passion of baking run wild for Chanukah (which would make a ton of sense considering you may have been meshuggah enough to host a giant Thanksgivukkah party.) However, lately you have found that you haven’t been doing these things as much as you would like. Perhaps you were taking comfort in going to minyan and meeting new people and then for one reason or another just stopped. Inside of you as with the trees it is time for an awakening. One that will allow you to flourish and blossom just like our trees. This doesn’t happen over night. Our trees won’t bud tomorrow, they will simply begin to put their energy in that direction, that will allow us to appreciate them. Perhaps you can take this Tu B’shevat and begin to use that energy to awaken yourself so that you can greater appreciate the world around you. We don’t have the luxury of living up to 6,000+ years but if we can appreciate today maybe we can plant the seeds for others to appreciate their tomorrow. Melissa Bullins is an Atlanta based chef and is active in the local Jewish community at Shabbat Atlanta. Come hang out with Melissa and the Shabbat Atlanta chavurah!